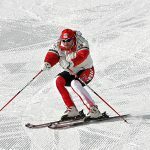 As I have mentioned in other articles on this site, the active use of both skis in the turn serves as one of the fundamentals of modern technique. 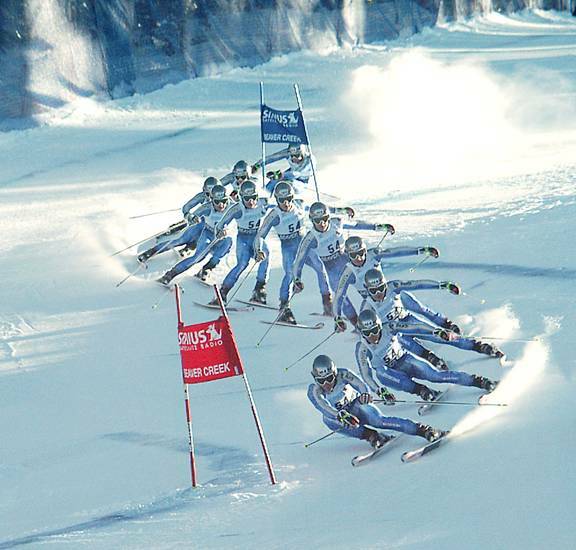 While the outside ski plays the leading role in the initial phase of the turn, the action of the inside ski is crucial in carving the final part of an arc. 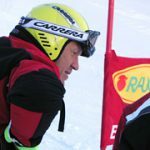 In this article I would like to focus on particular technical nuances of carving the arc of a turn with the help of inside ski. 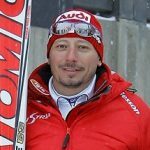 First of all it is necessary to mention a very simple fact, which is well known to coaches and racers – the force of gravity and inertia at the exit of the turn, when used properly, always provide for more speed than what skier can create by any special movements or muscular efforts. A clean optimally rounded arc of a so-called “pulling radius” (a comma shape) allows for the most efficient transfer of energy from one turn to another. 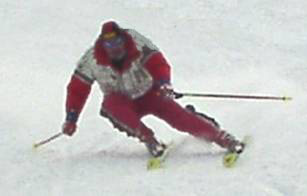 In order for such a transfer to happen, when teaching modern technique, the emphasis should be placed on having parallel shins and an equal degree of edging, with both skis drawing arcs of concentric circles. This is, indeed, an ideal model. It is achieved, in reality, only with a certain degree of approximation. Nevertheless, racers should really strive for ideal carving with both skis edged equally simply because it is the fastest way to make turns in the course. Constantly trying to get the outside ski as far as possible to the side out from under the body in order to get it on the right line can result in a slight A-frame. Possibly there is an insufficient projection of racer’s center of mass forward and over the skis at the moment of beginning of the new turn (i.e., a poor re-centering after the previous turn). Sometimes the cause of A-framing can simply be low speed, which does not allow starting the turn by inclination with the parallel shins. Whatever the cause may be, racers are often caught in the A-frame position with shins being far from parallel in the initial phase of the turn as I demonstrate in the photo below. 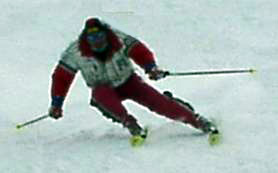 In this picture my left leg is extended and a high edge angle is created with the outside ski. However, my inside ski is edged significantly less and is sliding almost flat on the snow. Trying to continue the turn with this position of the legs would not bring me even close to carving concentric arcs. 1) Either the inside ski gets more loaded, goes practically straight and “unlocks” the outside ski from the arc. The outside ski is then drags through the rest of the turn, which contributes to loss of speed. 2) Or the skier manages to keep pressure on the outside ski (which is quite difficult to do) and the inside ski floats and slows down the turn. In the latter case, Problem #2, the edge of the outside ski locks excessively, which also contributes to loss of speed in the turn. In neither case will the speed be maintained with an effective transfer of inertia into the next turn. The solution to the problem is obvious – both skis need to work in unison while carving the arcs. However, this is not very easily accomplished on a consistent basis. By the time a skier exits the fall line, the shins have to be close to parallel. It is central to remember that the ski tips should be level. 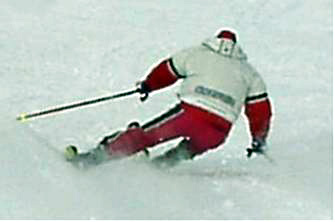 Excessive sagittal split, with one ski ahead of the other, does not allow the effective loading of the inside ski so that its edge is locked into the snow. If the shins are parallel and the saggital split of the skis is minimal, the skis carve the clean arcs without interfering with each other.The inside ski is always bent less and carves the arc of the greater radius. 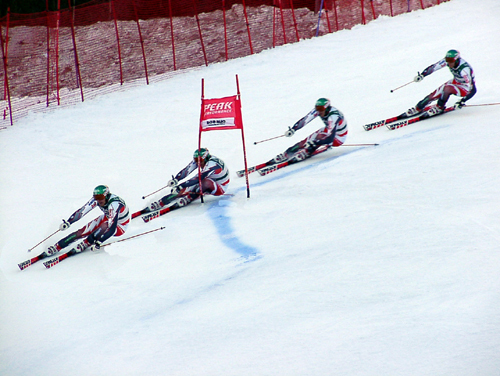 However, the skis do not cross even though their tips may get closer to each other in the final phase of the turn. As seen in the next picture, I achieve near perfect parallel shin position in the completion phase of the turn. At this point, almost equally edged skis are positioned far from under my center of mass. Right in this phase of the turn the maximum load is placed on the inside ski. In order to maintain a dynamically balanced position at the final phase of the turn, it is recommended to feel more pressure on the heel of the outside foot while simultaneously feeling the front of the boot. The contact between the shin of the inside leg and the tong of the boot is increased. At this point skier should clearly feel the pressure building on the outside part of the inside foot in the area of ball of the foot. The movement resulting in matched shins is quite apparent. Let’s see how these movements are applied by World Cup racers in a race course. In this photo montage, we see a winner of a number of World Cup races, Kalle Pallander of Finland. It is easy to notice that Kalle begins the turn with less than parallel shins and not equally edged skis. In fact, the inside ski is almost flat and the inside hip is quite far from the snow (frame 1). However, in the process of making the turn (frames 2 and 3), Kalle moves inside, in the direction of center of the turn. 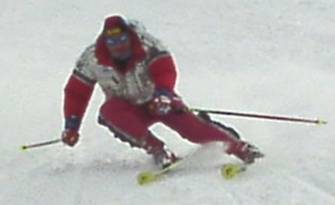 At the same time, he moves the inside knee in toward the center of the turn, which results in increased edging of the inside ski. 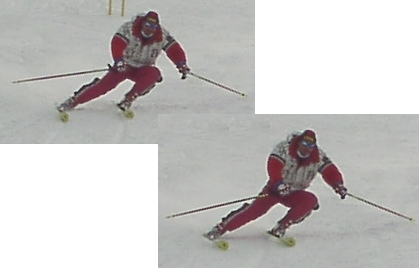 By the beginning of the final phase of the turn (frame 3 at the gate), Kalle matches his shins and achieves near perfect body position with skis almost equally edged. 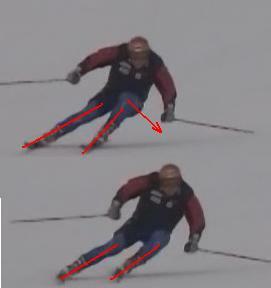 At this moment, the displacement of the body inside the turn is evident if we compare and contrast Kalle’s inside hip position in frames 1 and 3. In frame 4 the arc is practically completed and Kalle begins unlocking the edges by moving the CM forward. 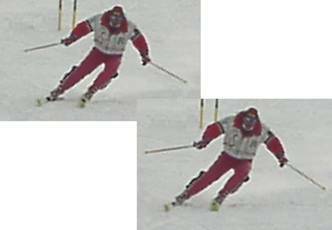 This movement results, again, in an unmatched position of shins, which happens because the edge of the outside ski starts getting unlocked first while more weight moves for a very short moment onto the outside edge of the inside ski. Here we have the very promising young Swiss racer Daniel Albrieght. I suppose that it is evident from this montage that Daniel, like Pallander, strives to maintain his speed in the final phase of the turn by moving the inside knee and matching the shins. Considering that carving an arc takes not more than 0.5 second, the movement of the knee into matched shins position has to be performed at an instinctive level. Therefore, it requires some targeted technical work and fine tuning. First of all, it is very important that the movement is not reduced to just moving the knee, but takes place concurrently with the displacement of the body inside the turn. Just the knee movement will result in excessive edging of the inside ski or catching the edge instead of carving the final phase of the turn with both skis. I would like to share one simple drill for developing shin matching movement. Initially, this drill should be performed at low speed on a relatively flat slope. The difficulty of this drill is exaggerated by extremely wide position of the skis. It requires a certain level of balance and precise distribution of pressure between the heel of the outside foot and the ball of the inside foot. The sense of contact between the inside shin and the tong of the boot is also very important, because it allows you to keep the ski tips even. Preformed correctly this drill instills proper skeletal alignment used in the regular turns. While working on matching the shins with the help of this drill or just making the turns on a groomed medium slope, racers can feel that all of these movements are too simple and come way too easy. I often have to discourage these types of illusions. All it takes is to move to a steeper hill and increase speed. Then, matching the shins and a timely engagement and pressuring of the inside ski becomes a very difficult task. In the race course, the task is even more difficult. Therefore it is worth spending time working on matching the shins in free skiing as well as in the course, gradually increasing the speed and the steepness of the slope. Proper timing and symmetry on both sides have to be achieved before moving to higher speed and more difficult terrain.